Adaptable storage systems make life easier when workspaces grow, shrink, or require rearrangement. Versatility in food service and production, hotels, production floors, and more requires durable, cross-functional storage in hot, cold, and humid environments. The electrostatically applied, baked and cured black epoxy finish offers NSF certification and Quantum shelving's 10-year guarantee against rust and corrosion. Hold 600 - 800 lbs. on each shelf and assembly is just minutes tool free with the included hardware. 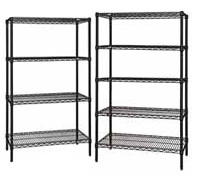 54" height black wire shelving unit. Consists of 4 posts and your choice of 4 tier or 5 tier shelf configurations. 63" height black wire starter unit. Consists of 4 posts and your choice of 4 or 5 shelves. 74" height black wire shelving unit. Consists of 4 posts and your choice of 4 tier or 5 tier shelf configurations. 86" height black wire starter unit. Consists of 4 posts and your choice of 4 or 5 shelves.